This close-up shows the incredible design and markings on the Heuchera leaves at the edge of the Hen House Garden. Heucheras naturally grow propped up, so the stones complement their design. 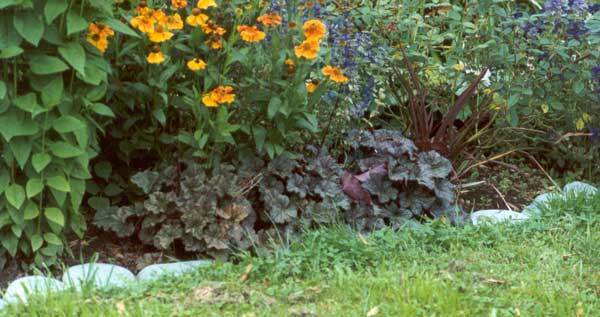 Heucheras make excellent edging plants. They sit well on the stones I use, and their leaf colour makes a great contrast with a freshly mown green lawn. 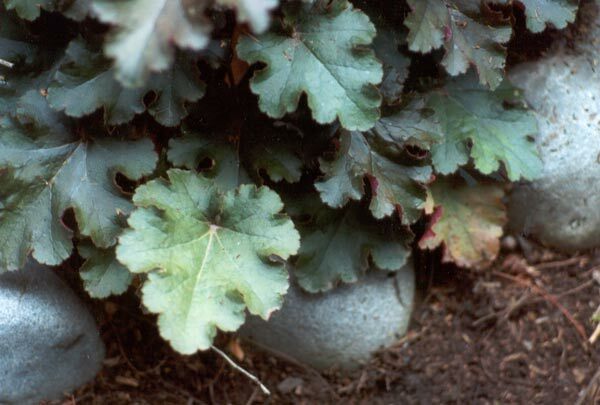 They are one of the perfect foliage plants to grow. The photograph below was taken early in the Hen House Garden's history in the summer of 1999 - the resulting look hasn't changed much since. In the summer of 2003 we had a series of extra hot days, and I noticed the temperatures proved far too hot for the Heuchera - its leaves got badly burnt edges.